The classic Strawberry Pretzel "Salad" - a crushed pretzel crust, sweetened cream cheese filling and a strawberry Jello topping with fresh strawberries. Preheat oven to 400 degrees F. In a medium bowl, stir together the pretzel crumbs and sugar. Pour the melted butter over top and stir with a fork until all of the crumbs are evenly moistened. Press into the bottom of a 9x13-inch baking pan. Bake for 10 min, then cool completely. Using an electric mixer, beat the cream cheese and sugar on medium speed until light and fluffy, about 3 minutes. Using a rubber spatula, gently fold in the Cool Whip. Spread evenly over the crust and refrigerate while you prepare the topping. Place the dry Jello in a large bowl and add the boiling water. Stir for at least 2 minutes, until the gelatin is completely dissolved. Stir in the cold water. Refrigerate for 1½ hours or until slightly thickened (will the consistency of egg whites). 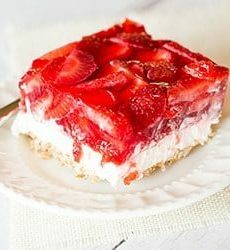 Stir in the strawberries and pour over the cream cheese layer. Refrigerate for at least 3 hours, or until the Jello layer is set. Cut into squares to serve. Leftovers should be stored, covered, in the refrigerator for up to 3 days.